Sometimes when I visit a wine region it all makes instant sense, the topography, the climate, the soils and the traditions. Virginia was not like that and I found it hard to get a real grip on the place. As it is so large and the conditions vary, there appears to be no single statewide solution to any grape growing problem and no one perfect grape variety. 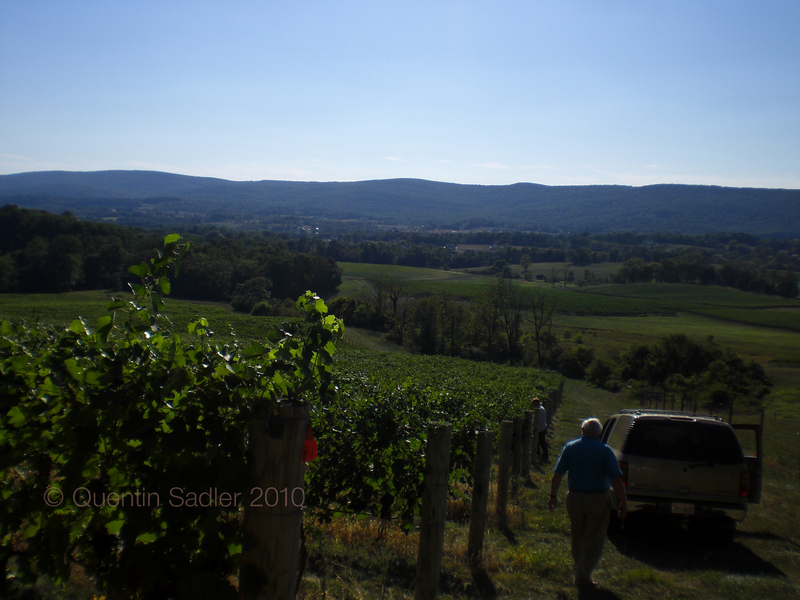 What is more we are so used to being able to dismiss vintage variation on anything but the finest wines nowadays, that it is a shock to find a region where no two years are the same and where there is no such thing as an average year – vintage is crucial to Virginia. In so many ways Virginia is the heart of the United States of America. It contains the original English Colony of Jamestown which was founded in 1607 – as well as the Lost Colony of Roanoke which was there from 1585-1587. Virginia was the site of America’s first experiment with representative democracy when the House of Burgesses was established in Jamestown in 1619. Many of the greatest characters and thinkers of the American Revolution were from here; George Washington, Thomas Jefferson, Patrick Henry, James Monroe, James Madison. Seven signatories of the Declaration of Independence were Virginian, as was Robert E. Lee. Unsurprisingly the area around Washington and Richmond is littered with Revolutionary and Civil War battlefields. True there have been sporadic experiments with grape growing and wine making ever since 1609 when records show that some wine was made from native grapes. So important was wine, that for a time it was a legal requirement for every Jamestown householder to cultivate at least ten vines. They even went so far as to employ French experts to help grow these European vines, but the humid and unusual conditions defeated them. It has not been recorded as such, but it is possible this was the first European tangle with phylloxera, which is rife all along the East Coast of America. Greater success was achieved by Charles Carter of Cleve Plantation in Hume. By the 1760s he had 1,800 vines planted and even sent some wine to London to be sampled by the agriculture committee for the Society for the Encouragement of the Arts, Manufacture, and Commerce (now the Royal Society of Arts), which offered prizes for all sorts of endeavours in the colonies, among them vine growing and winemaking. The two wines were made from the American winter grape – almost certainly a native variety – and white Portugal summer grapes – possibly a European or Vitis Vinfera grape, perhaps even a Madeira variety. Barrel fermented in 15% new French oak. The nose was delicate and creamy and notes of white peach, toast and vanilla. The palate too was delicate with gently creamy nutty characters, good acidity and beautifully integrated oak. Very good indeed with lovely balance and a long clean finish – 90/100 points. This seems to be an isolated incidence of success and as far as we can tell the conditions eventually defeated Carter just as they did Thomas Jefferson at his Monticello estate from 1774-1816. 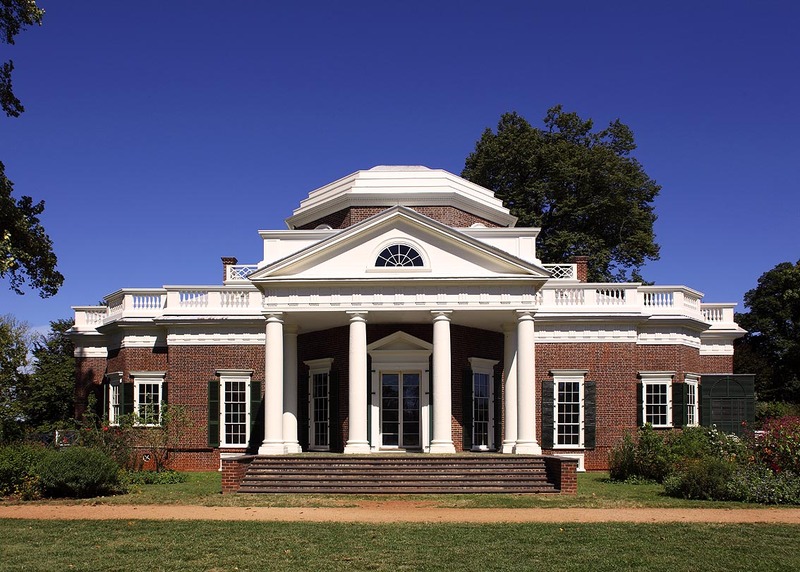 Although some people – like Gabrielle Rausse the current grounds manager and winemaker at Monticello – are convinced that Jefferson did manage to grow Vinifera there. In the early nineteenth century there was a little more success in that grapes were grown and wine produced, but mainly from the strong Norton grape, which is regarded as a native and does not require grafting to survive phylloxera, however it may be a cross with some Vinifera. I will be writing more about Norton soon, so remember to come back in order to hear more about this fascinating grape – I hope to put together a tasting of Nortons from Virginia and Missouri and Riedel have promised to send me some Norton glasses too. Of course by the 1970s viticulture was better understood and some people were convinced that Vitis Vinifera could successfully be grown in Virginia. Amongst them was Gianni Zonin, who in 1976 decided to create a new winery, Barboursville, here as the only US subsidiary of their Veneto wine empire. It seems that this was the catalyst required to kick start wine production in Virginia and other pioneers quickly followed suit. This appears late, but remember even in California the first new winery created since prohibition was Robert Mondavi’s in 1966. So, for the new interest in wine and a new mood to be felt in Virginia by the mid 1970s was not that long a time lag. Added to that of course, Kentucky and Tennessee are not far away – Western Virginia and the Appalachians are traditionally moonshine and whiskey country rather than wine. So, what made the growing of Vitis Vinfera possible in modern times, when success had eluded people for hundreds of years? Unlike New York’s Finger Lakes region, there does not appear to be one simple answer. Site selection seems to be even more crucial here than in gentler climates – it is important to avoid the worst heat and humidity, so high land on the Blue Ridge or lower land cooled by Chesapeake Bay seem to be the most favourable. Most of the experiments with growing Vinifera predated the late nineteenth century understanding of and defeat of phylloxera. So by the 1970s it appears that no one had grafted vines in Virginia before and that is surely the single greatest difference between modern Virginian grape growing and the experiments of the past? 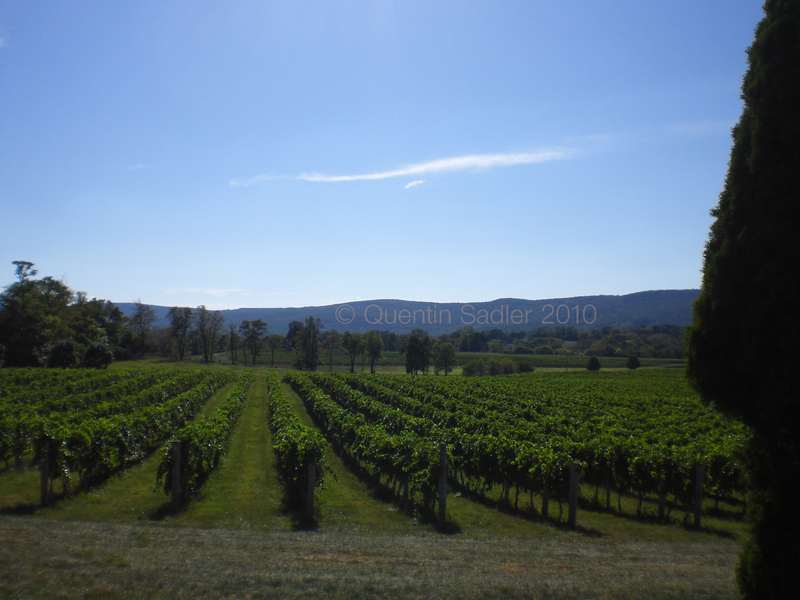 The Virginain wine industry of the nineteenth century had settled on the pretty much exclusive use of Norton, which does not need grafting like Vinifera vines do. Of course we live in times where the science of grape growing is more understood than ever before, so just grafting the Vinfera onto hardy American rootstock – very often Vitis Riparia or Vitis Rupestris – is not enough. We can now have the best rootstock for the specific Vitis Vinifera variety being grown coupled with the correct rootstock for the PH levels in the soil as well. Obviously a lot more is needed, but those two factors are vital to giving the plants the chance of survival, which is surely what makes it possible to have a modern Virginian wine industry. On my trip, I visited many wineries who had taken these basics and then with determination, dedication, love and understanding coaxed extraordinary results out of their grapes. Once you can get the plants to thrive in the climate, obviously you then need a grape that gives good results and that makes wines that people actually want to drink. It was very interesting seeing how the Virginians had coped with this. Originally they planted what the rest of America grows, Cabernet Sauvignon and Chardonnay and some continue to get good results – there is some excellent, delicate Chardonnay produced in Virginia. However, Cabernet Sauvignon is a late ripening grape and does not suit the Commonwealth’s short growing season. As a consequence the Virginian grape growers have had to think a little out of the box when it come to knowing what grapes to plant. Right now Viognier seems to be their white grape of choice and it is giving them very good results indeed. This superb wine was one third fermented in French barrels and aged on the lees – Jim Law who owns Linden is one of the giants of Virginian wine. Good nose, mineral, subtly zesty with a taut quality and a whiff of herbs as well as something more exotic like tangerine or passionfruit. Clean and pure and mineral with a little touch of ripe tropical fruit, almost pineapple with lime and quite a rich texture overlaying the acidity. Acidity below the weight, zestiness on the finish and a little creamy ripeness – 90/100 points. This too was barrel fermented – Breaux favour barrels made by the staves being immersed in water to be bent, rather than steaming. They claim it gives softer results and better integration. The nose was of zesty lemon curd. The palate was very soft with a backbone of acidity that does not dominate and subtle toasty spice all with a delicately creamy texture, very attractive, but very soft wine – 89/100 points. Andrew Hodson’s Veritas was a real highlight of my trip, his wines are consitently elegant and fine. This has lovely aromatics – green and zesty with a little grapefruit and minerality. The palate was bursting with lemon and lime, with a slightly creamy quality from partial barrel fermenting giving it an elegant fatness all the while kept balanced by crisp acidity. Really good complexity and lovely stony minerality and acidity on the finish – 92/100 points. Personally I was thrilled to see some Spanish white grapes being used too, in particular I was really struck by a Verdejo from Keswick Vineyards (pronounced Kez-Wik locally). As with some noble exceptions Sauvignon Blanc does not seem to prosper in Virginia’s climate, perhaps this Verdejo is a pointer to the future of crisp dry white wines in the Commonwealth? It is a lovely grape, full of flavour and will appeal to anyone who enjoys Sauvignon Blanc. Willowcroft Vineyard’s 2009 Albarino from Loudon County in Northern Virginia, not far from Washington, showed the richer, almost Viognier-like side of the variety. Nearby Chrysalis Vineyard on the other hand produced a 2009 Albariño that showcased the grapes’ delicate characteristics, still scented and fragrant, but with a crisper seam of acidity. Another unusual white wine that is being put to good use in Virginia is Petit Manseng, this is originally from the French Basque lands – where it makes most famously Jurançon – and it is also used a little in the Spanish basque region where its use is allowed in Txacolí de Álava. As for red wines and red grapes, as with the whites Virginia is somewhat spoilt for choice right now. They have a need for early ripening varieties as the climate is not generous enough to ripen Cabernet Sauvignon or Carmenère, of which there is a little. So, they have turned to Cabernet Franc as their signature red grape – and there are some superb examples that are not overshadowed by their Loire Valley cousins in any way. Recently there has been some superb results with Petit Verdot as well, which is very strange as this variety is considered a late ripener and in Bordeaux ripens later than Cabernet Sauvignon – hence the name which means small green. I kept asking why it seems to work in Virginia and why, given its reputation, they planted it in the first place? From the varied answers I received I am not sure that anyone really knows, perhaps some things just cannot be explained? I tried superb examples of both as well as Bordeaux style blends and some excellent Nebbiolos as well and will write about some of these soon, remember to come back. 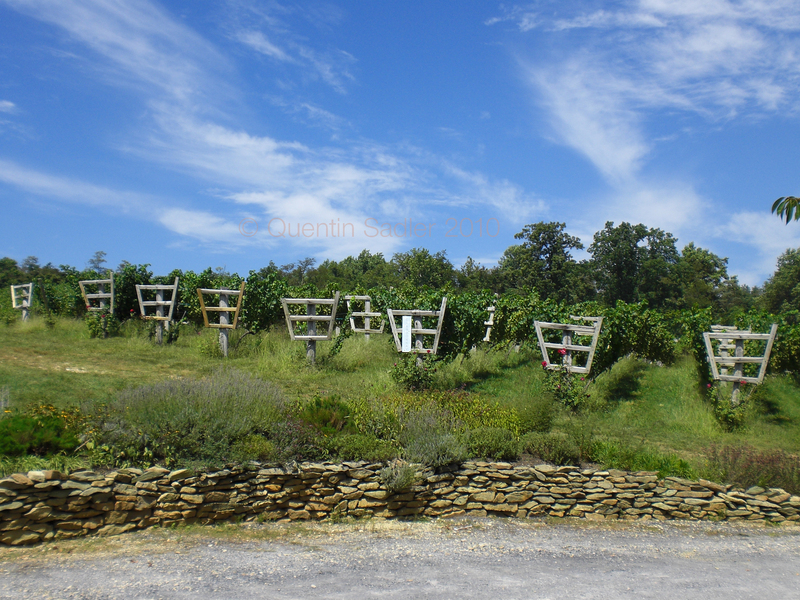 All in all Virginia is a beautiful wine producing region that makes wines that will really appeal to those who like classic wines with good fruit, but a very European twist and feel to them. I certainly returned excited about the place, the people and its wines and will write about some of the wines and wineries that I visited soon. Some Virginian wines are available in the UK through New Horizon Wines, Whole Foods Kensington and The Good Wine Shops in Kew and St Margarets. 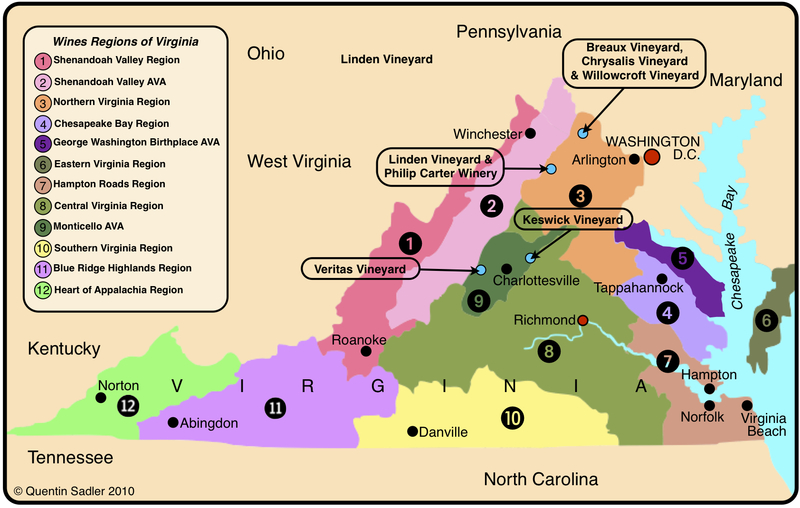 More information about Virginia wine is available here. Nice intro, Quentin. Virginia’s history is fascinating and so intricately connected to our own. I loved reading your article. It’s always interesting to see your area through another’s eyes. I will have to keep asking the Petit Verdot question and see what answer comes back to me.